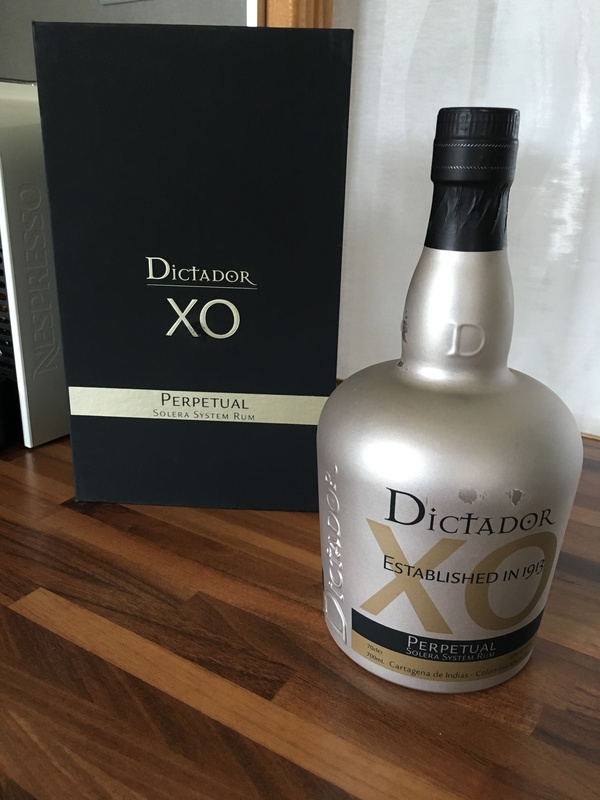 Have you found an online vendor selling Dictador XO Perpetual? Back to solera rum for these both Dictador rum from Columbia. Time for Perpetual : Same beautiful dark color. The coffee, vanilla, honey, caramel and chocolate are present. This one is drier with a more robust body. The finish is also long. 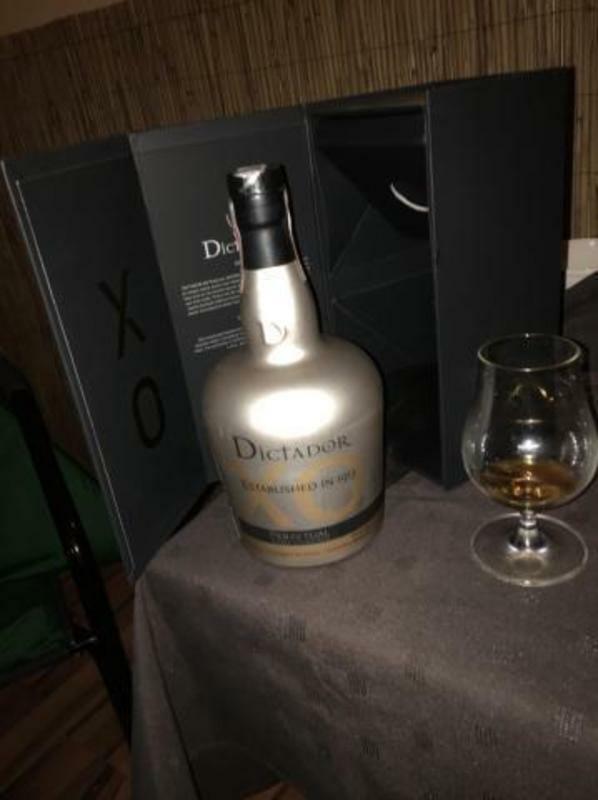 Dictador made two different rum with one dry , and the insolent more softer. This one should be better for rum connoisseur. To be also into your collection. 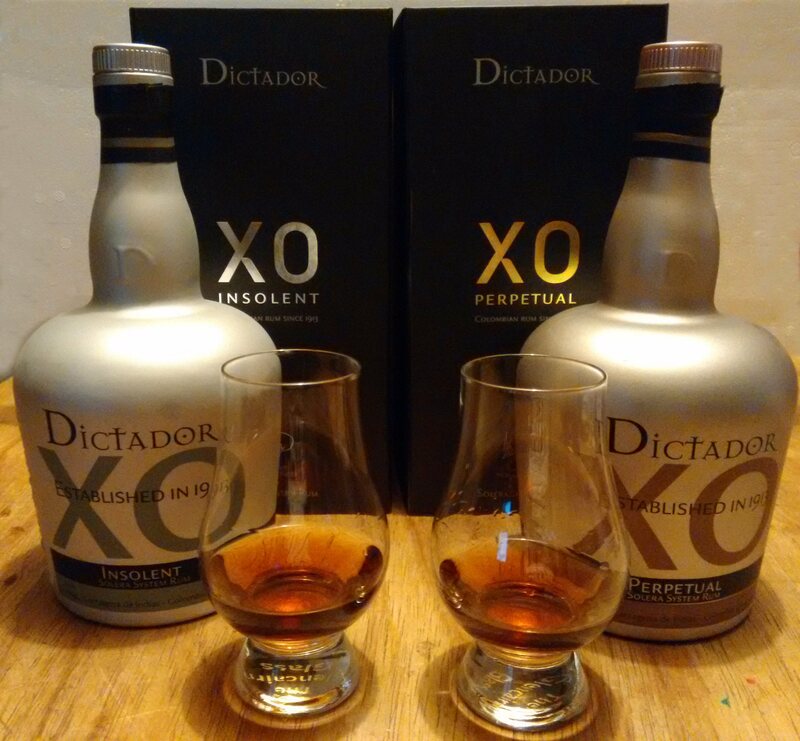 Way back in May of this year I wrote my thoughts on the Dictador XO Insolent rum giving it a well-deserved 9. 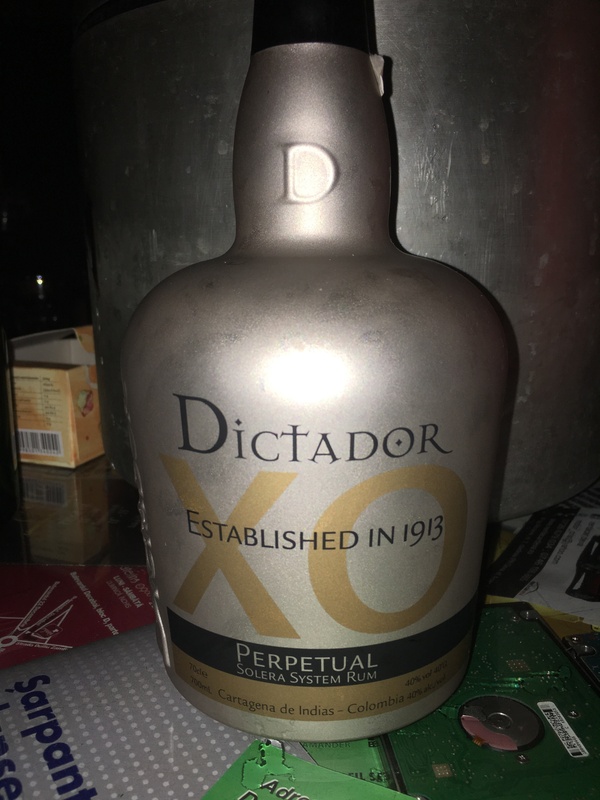 I made that bottle last until now so I FINALLY broke out my bottle (poor choice of words) of Dictador XO Perpetual. And I ask myself, "What took you so long?!?" If you read my review of the Insolent you are going to find me repeating myself in several areas. With that said...or written...let me get started. I got this along with the Insolent at Total Wine and More in Jacksonville, FL. As with the Insolent rum the Perpetual also is a deep and rich mahogany color with excellent legs and a fantastic aroma in my snifter. I swear I detect the hint of cinnamon and vanilla. As with the Insolent rum the Perpetual is also not a sugared rum. However there is an initial sweetness to it that quickly changes to a tannin-driven slight dryness. A very perplexing but delightful balance. I also detect toffee, coffee, and vanilla with a hint of cinnamon so apparently my olfactory system seems to be working. I do like this rum. A lot. I do notice similarities between my impressions of this rum as compared to the Dictador XO Insolent rum. Which means I will need to do a side-by-side tasting to try to figure out, in my own weird way, what are the differences between the two rums. Oh, if I only had another bottle of the Insolent rum. I had a nice long weekend in St. Augustine before Hurricane Matthew about a month ago and stayed at the Edgewater Inn (wonderful motel at the end of the Lion Bridge -- sadly they received a lot of damage and are currently closed until repairs can be made -- I do plan on going back) and my wife and I drove up to Jacksonville to replenish some rums I found I really, really like but cannot get locally. Of course I got another bottle of the Dictador XO Perpetual and Insolent rums. So I will soon be having a little side-by-side comparison with my thoughts appending both reviews. And this rum embodies what Coach Lombardi meant. Ceva deosebit.. Exclusivist și rafinat. Un rom super premium dacă se poate numi așa. Am rămas plăcut impresionat. Merită 10 fără nicio îndoială dar mai există și INSOLENT-ul care chiar este 10. Absolutelly a good choice. A very different rum, it's a masterpiece. Notation Personnel : 8/10 . Ochutnán ve srovnávacím testu s D 12, D 20 a XO Insolent. Shrnutí: Značka se drží svého stylu, jede si to své a dělají to dobře. The rum is excellent. it has a strong smell that continues into the body of Vina walnut. Perpetual is very smooth, with a silky finish that lasts and gives away aromas of vanilla and nut. My wife says she can feel also coffee and dark chocolate hints. First impression is that you have buy a high quality rum. Provided with a very beaytiful packaging, you are not dissappointed when you open the bottle. Once served in your glass, you can admire the dark brown color of this devine liquid. In the mouth,you will find a taste of coffee with a little bit of toffee. The aftertaste is quite long. This rum is well balanced. Really a good one. The next one to taste will be his little Insolent brother ... Yummy !!! Один из самых любимых ромов. С хорошей сигарой, получается фантастический дуэт! Sehr ausgewogen im Geschmack mit perfekt eingebauter Süsse, die perfekt zu den holzig würzigen Aromen passt. Genau so mag ich meinen Rum, Schluck für Schluck. Apparently this rum is aged in bourbon barrels. Slightly more mellow on the nose than the 20 Yr, but VERY similar scent profile. Almost indistinguishable. Still has lots of apples/pears, and alcohol on the nose. The taste is by far the best of the three Dictator rums I've tried. The bourbon aging seems to mellow it out, has added a lot of complexity, and is very rich. Had this side by side with ED21, and although they are completely different, this is right there in the same class. However, looking at internet prices, this bottle typically costs between $100-$120. In that case, I'd probably choose the ED21 or a couple bottles of Diplomatico Exclusiva. 92+? This rum has some very unusal qualities - sio much so that I reckon a lot of regular rum drinkers could easily pick this out in a blind taste test - perhaps even in a smell test. On the tongue - coffee and bitter walnut, a little dark chocolate, leather, oak and tobacco, dried fruit in the background and a little molasses. After-taste - quite harsh on the tongue with a strong burn. Plenty going on but I did not enjoy the after-taste as much as the smell or the taste and so for me it loses marks there. For those who've not tried it, it's perhaps a little like La Hechicera, but not smooth as that and stronger in the aftertaste. Also it doesn't quite have the sweet background taste of that rum. It's expensive and I'd honestly prefer quite a few other rums at half the price. Öffne meine alte Flasche Perpetual zum 250. Rating, ich finde das eine gute Gelegenheit. Schöns kupferfarbenes Mahagoni im Glas. In der Nase typisch Dictador, dieses tiefe, dunkle das einem hineinzieht und nicht mehr loslässt. Ein Fass voller Walnüsse die mit Lakritze umhüllt und mit reinstem Kakao bepudert sind, ein Lederbeutel mit karamellisierten Tabakblätter, Birnen, Pflaumen, Mirabellen...…..
Im Abgang der Immerwährend ist, Holz, Kakao, Kaffee, Leder, Gewürze, Früchte.... bleiben für immer auf der Zunge kleben. Open my old bottle of Perpetual for the 250th rating, I think it's a good opportunity. Beautiful copper-coloured mahogany in a glass. In the finish the everlasting is, wood, cocoa, coffee, leather, spices, fruit.... remain stuck forever on the tongue. Približne to, čo som očakával. Chuť karamelu, vanilky a čokolády. I’m not a fan. I can admire the overall structure and I can see why this rum is so well regarded. But for me it’s overriding butterscotch and toffee. On the nose and palate and forever in length. I do get other things going on but I don’t have a sweet tooth. I have great friends who love toffee. It’s simply not for me. Foursquare is rather more in my line. Not sweet what's good. Coffee taste. But flat taste in mouth. It doesn't offend but also it is not the best rum. Still very good. Rich brown color and a sweet aroma of coffee and caramel. The first sip is very enjoyable, with a bit of sweetness with coffee and toffee that leads to a long finish with hints of anise and dark chocolate that brings you back for more. Good rum with taste of licorice, coffe, vanilla . Little sweeter and alcohol good level. Had this side by side with the insolent. I prefer rums with a bit of molasses or fruit flavors. So I rated the insolent better. Having said that, this is an incredible rum... Cheers !!! Mineral nose with walnut and light caramel aromas. Very similar in the mouth which makes out for a great original sipper. Notes of coffee, walnut, slightly burnt caramel and even some dry fruits on the finish. Maybe not worth the price compared to whats availble on the market but an interesting sip.